Very little Archaic period research has been conducted in the Appalachian Summit region. Some Late Archaic sites have been excavated (see below), but much of the reconstruction of Archaic Period chronology, settlement, and subsistence in the mountains leans heavily of research in neighboring southeastern Tennessee. No deeply buried, undisturbed Early Archaic components have been excavated in the North Carolina mountains. Early Archaic materials in southeastern Tennessee differe from those recovered at the Hardaway site in North Carolina. 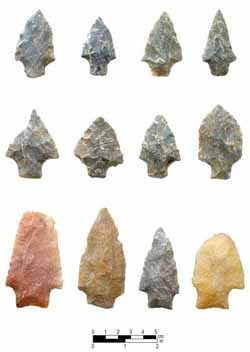 Other Early Archaic projectile point traditions, particularly side-notched and bifurcated base points, are present in the mountains. Most Early Archaic sites located in high, upland areas produced a wide range of tools reflecting hunting, butchering, hide working, and woodworking. 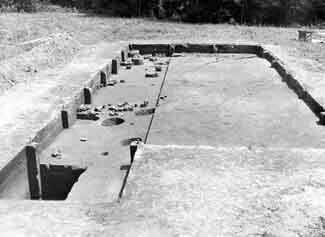 Early Archaic groups established only temporary camps in the rugged Appalachian Summit region, while maintaining more permanent base camps in the Ridge and Valley province of east Tennessee. 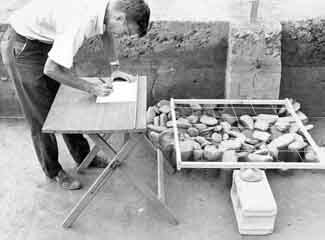 At these base camps in Tennessee, large quantities of charred acorns and hickory nuts were found, as well as prepared clay hearths. Impressions of basketry and textiles provide the earliest well-dated evidence of weaving in eastern North America. The Middle Archaic period in the North Carolina mountains is indicated by the occurrence of Stanly Stemmed, Morrow Mountain Stemmed, and Guilford Lanceolate spear points (much the same as the Middle Archaic in the Piedmont). Most Middle Archaic settlements in the mountains consist of dispersed camps situated on a variety of valley and upland landforms. This dispersed settlement pattern may reflect the slightly warmer and drier conditions of the Altithermal climate. In contrast to Early Archaic tools, most Middle Archaic specimens were made from locally available rock. Stone atlatl weights provide the first concrete evidence for the use of the atlatl. Stone netsinkers suggest the increasing importance of fishing. The Warren Wilson site in Buncombe County and the Tuckasegee site in Jackson County contained Archaic strata. Numerous rock hearths were present at Warren Wilson, and fragments of steatite bowls. View of the 1966 excavation at the Warren Wilson site showing exposed Late Archaic rock hearths (from Dickens 1976:23). Riverine resources were no doubt important in the Late Archaic. Hunting and fishing were supplemented by harvesting large numbers of acorns and hickory nuts. Squash and gourds were cultivated as early as 3000 B.C. and towards the end of the Late Archaic period sunflower, maygrass, and chenepodium were well on the way to being domesticated. 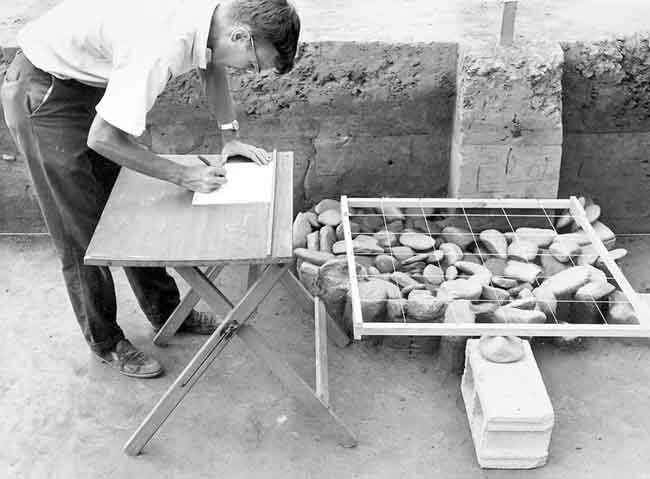 Roy Dickens plotting Feature 43, a Late Archaic rock hearth at the Warren Wilson site (Courtesy of the Research Laboratories of Archaeology). Late Archaic Savanna River Stemmed and Otarre Stemmed spear points at the Warren Wilson site dated from about 3000 to 1500 B.C. 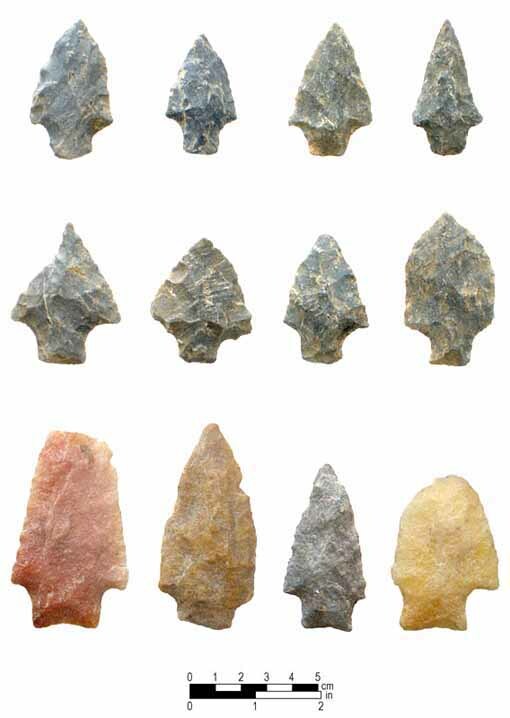 Savannah River Stemmed projectile points from the Garden Creek (bottom row, left two specimens) and Warren Wilson (bottom row, right two specimens) sites, and Otarre Stemmed points from Warren Wilson (top and middle rows).